I'm starting to make a static model of a wooden roller coaster and was wondering if there is a small wooden one anyone knows of that would be easy to replicate. It kinda does but I need one a coaster to do, not a kit to make one. If you want an easy wood, I would start with a simple out and back coaster. Not sure how big you want it, so I can't really offer any names. If it's your first model, do a simple coaster to start, or if you want to be challenged go for a little more complex. it's up to you. If I were making a model, I would probably build the Beast/SOB, along with Thunder road/Rebel Yell/The Racer. Challenging and looks good. Build a coaster that at the end you won't be like, "I guess i'm done." But more of, "That looks sweet! S**t, I wanna ride it!" Speaking from complete ignorance here, but Coastermodels.com always seemed a bit sloppy to me. The track is very jerky and offcenter at points. I know it takes alot of work to do it, and the support structure looks great, but I'd like to see the rails and curves look alot smoother. Maybe the biggest challenge in building a model roller coaster is the sheer size it will consume, even for a relatively medium-size coaster. I have plans for a model coaster on the drawing board, and an accurate HO scale model is going to require a space about 12 feet long (I figure the model would take up about as much space as a full size skee ball machine, and I think I would prefer to have a skee ball machine)! I'm going to have to do one of three things: (1) selectively "compress" the model (which is what I suspect is done with the modesl on rollercoastermodels.com); (2) build to a smaller scale; or (3) choose a different prototype. A jr. woody would make a nice little model but there's also little need to scratchbuild something like that when Coasterdynamix has that cool little Comet kit. I agree. The Coasterdynamix kit is really nice. If you want a static model that's very realistic in both appearance and scale, that would be a good idea. But since getting the thing to run is only a small part of the assembly process, you might as well make it work! If you're intent on building your own ride, I'd suggest a small out and back. The more turns you add, the more complicated things are likely to get. Cyclone at Williams Grove. You don't need to build as much structure since the much of the "back" section was directly under the "out" section. You might even be able to get pieces of actual wood from the coaster. Maybe something small like Beastie at KI? Make your own design. Somthing like 3 feet tall, 4 drops out a simple turn and then like 6 drops back. Somthing simple like blue streak. How about Fairly Odd Coaster at KI its small and has a simple layout. Like everyone else said build somthing simple like an out and back Hershey's Comet or even Thunderhawk at Dorney. Both are pretty much straight runs with a few turns. Too bad Chris Gray's CMG Models site is down for upgrading. He builds the most realistic wood coaster models I've ever seen. Gwazi, Thunderbird, Idora Wildcat, Ozark Wildcat, and Crystal Beach Cyclone to name a few. There are also a few pics of his models on Great Coasters website. If you were ever at GCII's office in Sunbury you probably seen a few of his models. If anyone could give you a few quick pointers on building a models hes the one. A lot depends on what you want to do with your model. If you want a true to scale model, then your best bet would be to do a modle in which builders plans are available. I believe the Euclid Beach Thriller plans are in one of the Euclid Beach books. I've also seen plans for the Rye Aeroplane and Crystal Beach Cyclone as well. If it's just the general feeling of a coaster that you want, then starting with photos of any park coaster might be enough for your to use, though partial plans might still help as well. 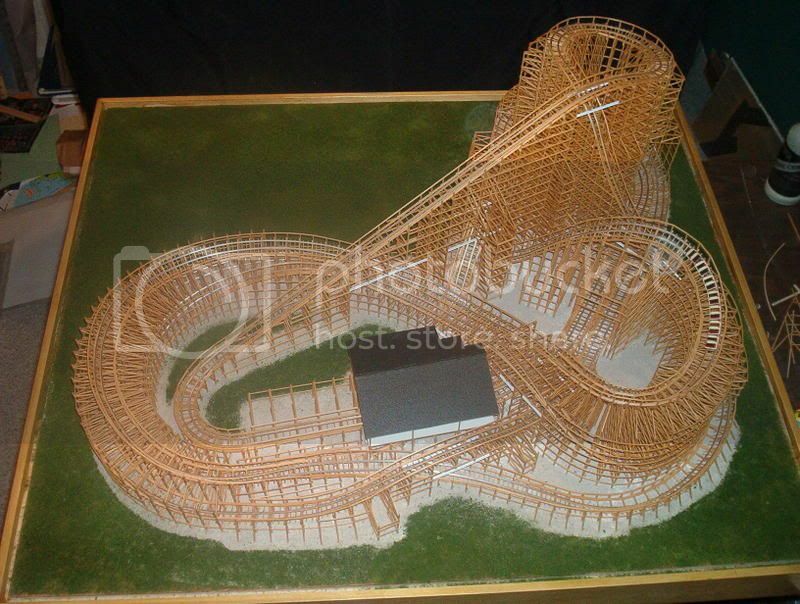 A friend of mine built two huge wood coaster models (custom designs) out of toothpicks. Those were actually featured in the newspaper a couple years ago. Good luck if you decide to go that route!